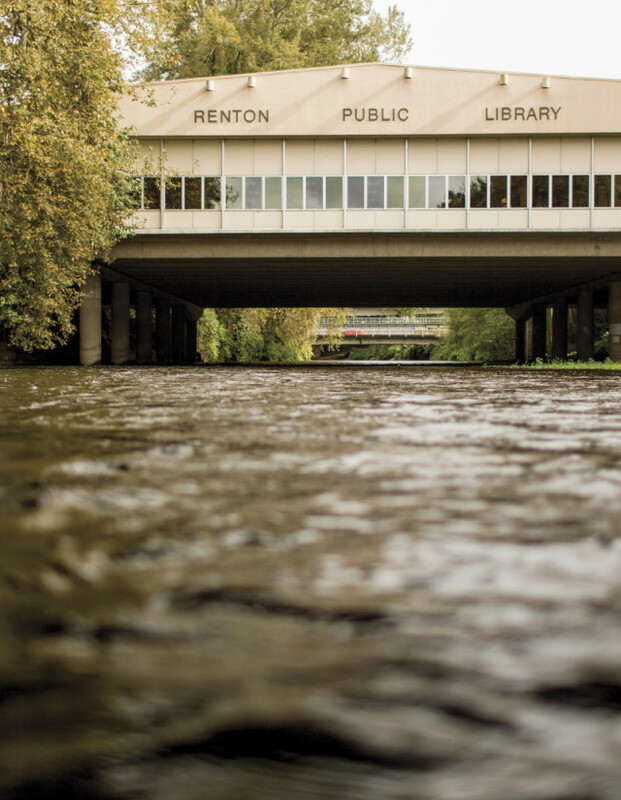 Since 1966, Renton’s main library has stood over the Cedar River. But when the city threatened to close it, Renton’s residents mounted a civic uprising that involved Tim Eyman, threats of a lawsuit, and the start of two political careers. “I didn’t know what you might want to see, so I brought everything.” Everything, in this case, refers to a white, coffee-table-book-size cardboard box overflowing with yellowed copies of the Renton Reporter newspaper, letters threatening lawsuits, a manual outlining the initiative process in Washington state, photocopies of newspaper clippings from the 1960s, printouts of emails sent by Renton municipal employees, and on and on and on. Pick up the box and it feels…heavy. No, weighty. Because not only is it so loaded with papers that it’s difficult to hold with one hand, but it also represents four years of Avery’s life. Through its haphazard organization the box chronicles his evolution from just another nine-to-fiver to a hyperinvolved citizen. All of which makes the box’s contents that much more surprising: Every document is related—some directly, some tangentially—to the Renton public library. It’s 7pm on a Tuesday in early September, and Avery is sitting in a booth at the Yankee Grill, a high-ceilinged and otherwise nondescript restaurant attached to a hotel in southwest Renton. The other patrons, most of whom are drinking beer and watching sports highlights on the TVs above the bar, appear to be winding down. Avery, on the other hand, won’t go to bed for hours. 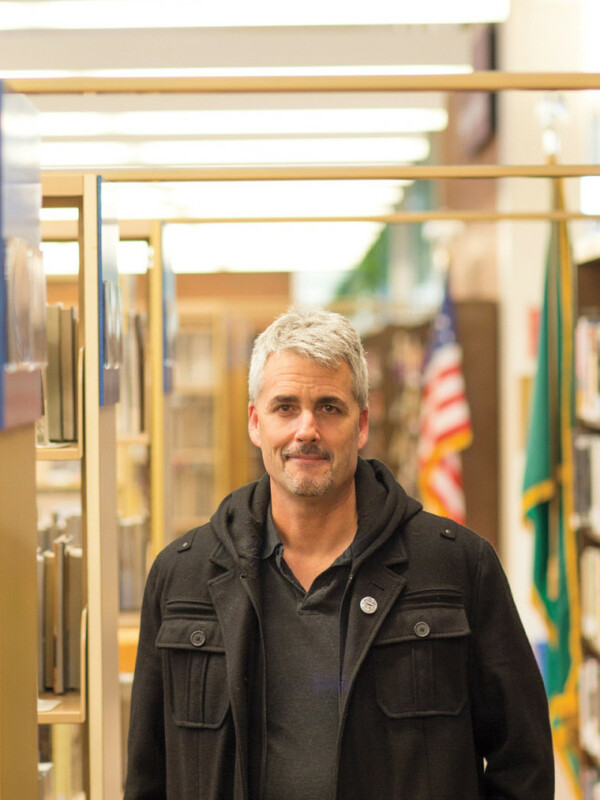 Talking about his involvement in a four-year, community-wide effort to save the Renton library—he calls it a saga—amps him up. It is, after all, the issue that inspired him to run for a spot on the Renton City Council this fall. Avery doesn’t say things like “over my dead body”; he’s too soft-spoken and genial. But he doesn’t have to either. That box, the nights he sparred with city administrators when he should have been mowing his lawn or working on the car in his driveway, the hours he spent gathering signatures in the rain, they say it for him. Renton, population 95,000 and change, has two libraries. The Highlands library is located in the northeast corner of the city. Built in 1973 for $176,000, it sits just blocks from Sunset Boulevard, which is studded with pharmacies, burger joints, and gold buyers. This story is not about that building. It’s about the one that abuts Liberty Park, which is also known to most as the Cedar River library. Or, simply, the Renton library—because when most Renton residents talk about a library, it’s this one. Opened in 1966, it replaced Renton’s first public library, a creaky, cramped little structure built 52 years earlier. The opening of the new library was cause for celebration. Winifred Daniels, the longest-tenured librarian of the former location, was there, as well as Florence Guitteau Storey, who’d been issued the first Renton library card in 1914. Flashbulbs popped and more than a thousand people watched as eight-year-old Laurie Renton, the great-grandniece of one of two men who brought the railroad to the area south of Lake Washington in the late 1800s, cut a gold ribbon held steady by mayor Donald Custer. When Stuart Avery and Beth Asher got involved in saving the Renton library, they were just two ordinary citizens, living ordinary lives. Now they’re running for city council seats. The celebration had a decidedly out-with-the-old, in-with-the-new vibe; Daniels had told the local paper, The Record-Chronicle, that the previous library couldn’t “be torn down too soon to suit me.” But even more than that the revelers were in awe of what stood before them. All 22,000 square feet of the library sat on a bridge above the Cedar River. Visitors approaching from the parking lot to the southwest or from Liberty Park to the northeast crossed to the midpoint of the bridge to enter, and when they came back out, books under their arms, they could stand at the railing and watch salmon slip through the water down below. The building itself wasn’t especially attractive. Pick it up and place it anywhere on dry land and it would be just another underwhelming, blocky, midcentury-modern municipal box. But it wasn’t on dry land, which made it rare among buildings worldwide. At the time only two other such structures existed: the Ponte Vecchio in Florence, Italy, and the Rialto Bridge, in Venice. Both held shops, and both were built centuries earlier. Not much has changed since then. 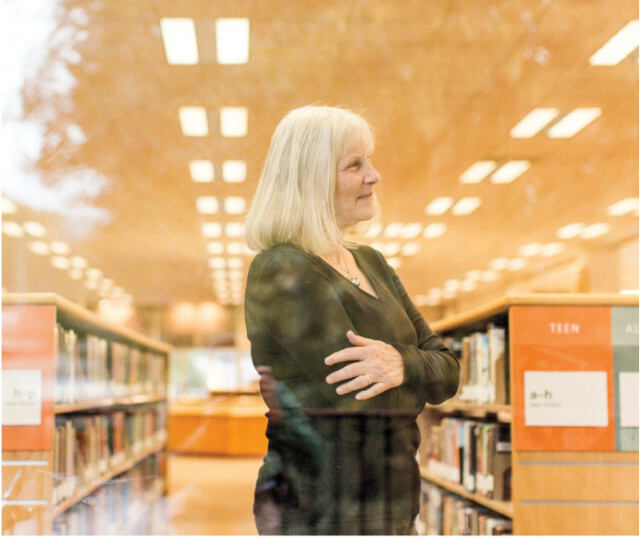 Renton’s river-spanning library is still the only one of its kind, and it is, for all intents and purposes, the exact same building that Laurie Renton stood in front of 47 years ago. Which is a good thing if you’re a strict preservationist, but not if you’re in search of a modern, functioning library. The concrete facade is weathered, the carpet is thinning, and the gold wallpaper above the checkout desk looks to be original. The plumbing leaks. The HVAC system is failing. In other words, it’s in desperate need of an update. And it has been for years. The King County Library System is enormous. It consists of 48 branches that blanket Western Washington from Shoreline to Enumclaw. Nine more are under construction, and five others are currently in the planning phase. And the construction or renovation of many of those buildings was made possible by $67 million and $172 million bond measures approved by King County voters in 1988 and 2004, respectively. All told, those libraries house more than 4.3 million items, from paper books to ebooks, movies to CDs. And if, say, Nicholas Sparks’s latest heartrending romance isn’t at your local KCLS branch, it can be shipped from another location within a day or two. Thanks to that efficiency, between 2010 and 2012, KCLS patrons checked out an average of 22 million items per year, making it one of the busiest library systems in the United States. Much of that growth has taken place under the watch of Bill Ptacek. The King County Library System was established in 1942—back then it was called the King County Rural Library District—to provide service to the county’s more sparsely populated areas. And it did so by either building libraries where none existed before or by taking over previously existing ones. The latter is known as annexation, and it has defined Ptacek’s tenure. Since he became director in 1989, KCLS has annexed more than 30 cities, and virtually all of those joined the system in the first decade of his reign. At first blush, annexation is an attractive option. By getting out of the book-lending business, a city gets to save money. And in most cases citizens get a shiny new library. Of course, they have to pay for it: As an independent taxing entity, KCLS can assess property taxes to fund construction and maintenance of its branches. The idea of annexation refused to die, though, and on February 9, 2010, Renton residents voted on Proposition No. 1 to settle the issue. The vast majority of prior annexation votes throughout King County had been embarrassingly lopsided; it was rare for less than 60 percent of voters to approve the move, and in many cases upwards of 90 percent favored it. But once the ballots were tallied in Renton—a process that ultimately took two weeks—only 50.21 percent of the city’s residents voted yes. Annexation passed by just 53 votes. KCLS’s presence in renton was felt almost immediately. New furniture, more computers, access to ebooks, longer hours—patrons were treated to several new services in spring 2010. But it would be more than a year before the biggest effect of the vote would galvanize the community. In fact, the city had been discussing moving the library for more than a year. In July 2009—seven months before the vote—Mayor Law and Bill Ptacek signed a contract that laid out what would happen in the event of annexation, and it made both sides’ intentions clear: “The City and KCLS agree to develop and construct replacement facilities for both the Main and Highlands Libraries on other properties within the City to be acquired and donated by the City.” And the voter pamphlet mailed out with ballots explained that a yes vote would authorize the city to build “two replacement library facilities” with taxpayer money. Yet ironically, given what a monumental change it would be to move the library away from the river, very little was made of the possibility before the vote. A flier stuffed into residents’ December utility bills focused mainly on the financial repercussions of joining KCLS—which, incidentally, were later proven to have overestimated the cost of staying independent—while only making passing reference to new facilities. Here’s where things get sticky. Mayor Law acknowledges that the possibility of moving the library wasn’t adequately communicated to the public prior to the February 2010 vote. “We should have made a big deal [about that] in the beginning and engaged the public,” he says. “If we could turn back the clock, I would clearly do that differently.” But he seems to take no credit for coming up with the idea to relocate the library. “When we were going through the process with KCLS to figure out where we were going to build the two new libraries, KCLS made it clear that over the river was not their preferred site for a couple reasons.” For one, he says the original location was too out of the way, and the library system preferred a more accessible space in Renton’s downtown core, close to the Metro transit center. For another thing, building (or rebuilding) over the river would be a logistical—not to mention permitting—nightmare. On the other hand, Ptacek says the decision was almost entirely the city’s. KCLS conducted a site analysis and made suggestions as to where a new library should go but, according to him, because Renton was footing the bill, KCLS “played second fiddle” through the entirety of the siting process. Indeed, if litigation is the benchmark for a contentious library transition, then the controversy surrounding the Cedar River library wasn’t that contentious. (Ptacek won’t even call it a controversy. “You’d love to make this about us versus them,” he says when asked at what point he realized he had a fight on his hands in Renton.) But it’s interesting that he brings up the topic of litigation at all. Because it was Ptacek who first threatened legal action when things started going sideways down by the river. In nearly 25 years as the director of KCLS, Bill Ptacek has overseen the construction or renovation of more than 30 libraries. Renton’s wasn’t the most controversial, but it wasn’t far off. Avery and Asher met at one of those meetings and agreed that they couldn’t give up. They believed that even though they were only two voices, they represented a much more widely held belief that the library was worth saving. Like anyone else who’s read The Seattle Times or watched local news in the last decade, Avery and Asher had heard of Tim Eyman and his love of the initiative process. They didn’t necessarily agree with his politics (“I think he’s a putz,” Avery says), but he’d demonstrated the power one person can have to effect change in local government. The only problem was, they had no idea how to go about launching an initiative campaign. Avery researched the topic online, but it wasn’t until he got an assist from the League of Women Voters, in the form of a link to the Initiative and Referendum Guide for Washington City and Charter Counties, that things began to click. “And I determined that based on what we wanted to accomplish”—in short, allow voters to voice their opinion on the location of the new library—“we had a chance,” he says. That September, they began collecting the 6,375 signatures of registered voters that they’d need to put the initiative on the August 2012 ballot. They had five months. Volunteers camped outside of the Target on Landing Way. They set up card tables at the Safeway on Third Street. Asher would leave her job in Issaquah at 5 on the dot and go straight to Target, where she’d stay until it closed. “I would get there at 5:45, because I drove like a bat out of hell,” she says. On February 7, Avery submitted the last batch of signatures, bringing their total to 7,263, well above the required number. Then he, Asher, and the rest of the small army they’d recruited, waited. And waited, until March 2, when they learned that nearly a third of the signatures couldn’t be verified. They had just ten days to make up the difference, which they did in a massive weekend effort they called Super Saturday. By the end of March, the initiative had been certified by the King County Department of Elections. As city council meetings go, the one that took place in Renton’s city hall on April 2, 2012, was a fiery one. For starters, it lasted three hours, thanks to public comments from nearly 20 angry residents. But it was the content of their comments that set the combative tone. They spoke of disenfranchisement and civil rights and free speech. They invoked the story of David and Goliath. And they threatened to pool their money to slap the city with a lawsuit. “I’m going to actually forgo getting new tires on my 1997 Jeep Grand Cherokee to help contribute my portion of legal expenses to try and do what the citizens of Renton have asked you to do today,” one of them, a man named Mark Martinez, explained from the podium. What the citizens had asked for, by virtue of signing Avery and Asher’s petition, was the right to decide whether to rebuild the library over the river or move it to the site of the old sporting goods store downtown. They’d even enlisted Tim Eyman’s attorney—to the tune of $1,600—for help in pleading their case to the city. But, citing the contract it had already entered into with KCLS, the city was objecting. If it were to allow the initiative to proceed and the people voted to keep the library over the river, the argument went, it would be forced to breach that contract, which was prohibited by city law. By the end of the night, the council voted—by a count of four to three—to reject the initiative. Marcie Palmer, one of the three dissenting votes, later wept in her car. Neither Mayor Law nor Ptacek will comment directly on the letters. Both refer instead to their commitment to the partnership. In fact Ptacek calls KCLS a “good soldier” that agreed to follow the city’s lead, wherever it might take them. When Avery describes his involvement in the fight for the Cedar River library, he talks of metaphorical doors that against all odds kept opening for him. The most significant one opened the day after that meeting. Having had a night to sleep on the public’s comments, the city issued a press release announcing that it would “explore some options” for allowing the citizens to decide the fate of the library. And two weeks later, the council voted again on whether to add the initiative to the August 7, 2012, primary ballot. This time they relented, by a vote of seven to zero. For months Avery had been told that arguing with the city and KCLS was pointless. And that summer, as he and Asher and the others who’d gathered signatures turned their attention to campaigning to keep the library over the river, they still felt, at times, like their efforts would be wasted. The group was taking on the city, and it had raised just north of $5,000 to convince at least 51 percent of the public that the library over the river was worth saving. On August 7, Marcie Palmer hosted an election-night party at her home to watch as the returns came in. Dozens of people, maybe even 60 or 70, showed up. Avery and Asher were there, and so was Mark Martinez, the man who was willing to drive on bald tires if that’s what it took to convince the city that his voice meant something. Even Donald Custer, the city’s former mayor who’d stood beside Laurie Renton at the library’s ribbon-cutting ceremony in 1966, made an appearance. And as the first reports flashed on the TV screen in Palmer’s living room, they could see the vote was a landslide. In the end, more than three-quarters of Renton voters chose to keep the Cedar River library right where it had been for nearly 50 years. It was finally over. Except that it wasn’t. 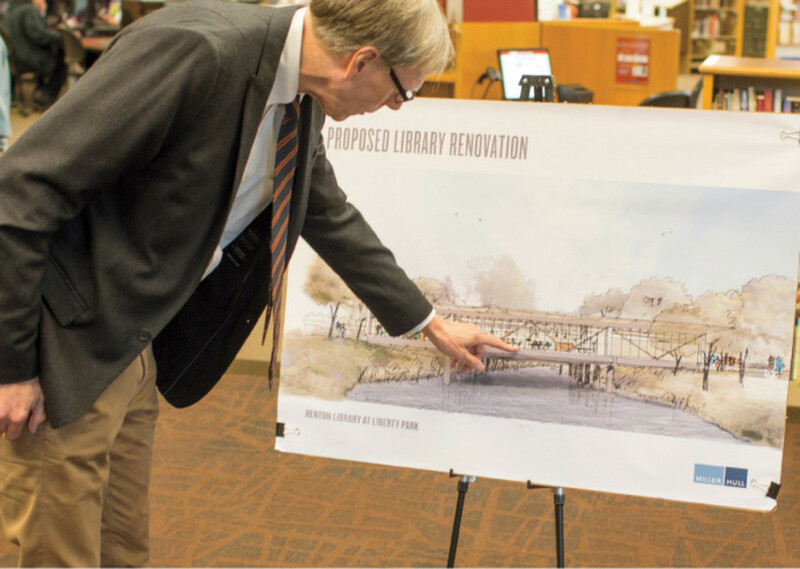 Initial designs for the new library over the river revealed a floor plan that was less than half the size of the building it would replace. Avery and Asher and their crew fought back and won again. The new library will be 19,500 square feet, just a few thousand less than the original. And then there was the entrance, the iconic opening at the midpoint of the bridge that—to some—made the library that much more special. It was deemed too difficult to pull off in the new design by KCLS’s architects; instead, patrons will enter from one end of the building. Beth Asher and others fought on (and, for the first time, failed), but that’s where Avery broke with the others. He’d accomplished what he wanted, and he had to turn his attentions to his campaign for city council; the experience of speaking up for the library had stirred in him a sense of civic duty, and so in June he filed to run for a seat vacated by the council’s outgoing president, Rich Zwicker. “I’m ready to move on,” he says. “I understand that you have to compromise and you’re not going to get everything.” His and Asher’s paths will cross again, on November 5. She’s also running for a seat on the council. process. So he’s walking a fine line between touting his involvement in it and distancing himself from the ongoing battle. Avery’s facing an uphill road anyway. He’s a political outsider, and his opponent, Armando Pavone, has already locked up Zwicker’s endorsement. He’s oddly Zen about the whole thing, though. “Whether I’m elected by popular vote to represent the city on the city council,” Avery says, “it doesn’t matter.” Besides, there’s still that car in his driveway that needs work and the lawn that needs mowing.